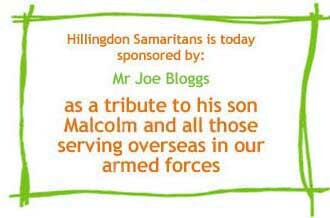 It costs just £50 per day to run Hillingdon Samaritans, which is incredibly good value, but we still need to raise these vital funds. Through our Ruby Appeal, which celebrates our first 40 years, we are asking you to sponsor a day – just once, or every year on the same date. Perhaps you have a day that reminds you of someone important to you, or wish to commemorate an anniversary or happy event in your life. Whatever date you choose, we will reserve it for you for as long as you wish. You can choose a message to be displayed on our website on that date. This can be anonymous, meaningful only to you, or could identify you, or a person, group or organisation you wish to commemorate or recognise the work of. Click here if you would like to help us financially without sponsoring a particular day. To sponsor a day, hover over the calendar, click on a day in the future that is not already sponsored, then fill in your details in the form below. You may re-click to change your selection. To chose a day during the next calendar year, click “Next year” button. Instead of just one year, you may pick your day and select “Until further notice”. We will remind you to donate each year. Or ring or email us for other options. You may provide a nickname or business name for us to display instead of your real name. Or just select “anonymous donor”. Your message can be anything, and doesn’t have to start with “as a tribute... ”. If you don’t want to display a message, just leave message field blank. Please wait – processing your submission. How should we identify you on our site? Would you like to payby credit/debit card?